Destiny Low felt a mother’s worst fear and greatest relief within about an hour. Destiny Low took her children, one 4 years old and the other, 22 months, to an Oklahoma City Jump Zone for a birthday celebration. Jump Zone provides a kid-sized inflatable play space, with slides, bounce houses, obstacle courses, and giant animals. Jump Zone is a popular venue for children’s parties because they are safe places to play. That is why Destiny Low felt safe enough to turn to talk to her 4-year-old daughter, without being too concerned about her 22-month-old son, Dawson. “I’m not the type of parent that ever thought I’d lose my kid in five seconds,” Low told KFOR. When Low turned back and didn’t see her son, she didn’t panic. She assumed he was off playing in one of the many play areas. But the longer she looked without seeing his bright orange outfit, the more frightened she became. “He doesn’t wander far from me, so that’s what scared me even more,” she said. She called the police and Jump Zone staff, who reviewed their security videos. This showed that Dawson hadn’t left on his own, and hadn’t been taken by an adult. “He’s hurt. He’s somewhere alone and hurt, and that is absolutely terrifying,” Low said. Jump Zone staff decided to turn off all the blowers, which kept the inflatables inflated, hoping they might hear Dawson calling. It worked. One of the children at the party heard the sound of crying. 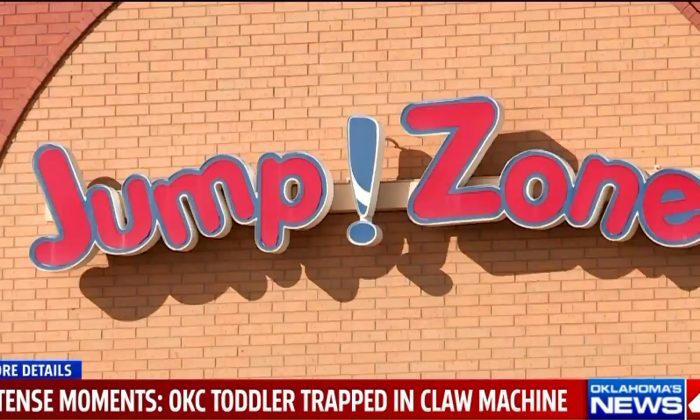 “So, once the blowers went off in there, it got quieter, and I’m told a little girl started putting quarters in that machine and heard him crying,” Low told KFOR. Somehow Dawson had wriggled inside a prize machine through a door, which didn’t open outward. With some effort, staff was able to pull the toddler back out of the machine. He was tired and sweaty—the inside of the machine was full of light bulbs, which generated a lot of heat. Emergency Services immediately treated the child. “He quickly responded to just the outside environment where we put him to cool down,” EMSA employee Colin Roy told KFOR. Low said she hopes the company which made the machine learns from her ordeal and changes the design of the toy dispenser.